Gabrielle Bushell has published a book detailing her battles with bi-polar disorder Bipolar - A Balancing Act, launched in October 2008, with a write-up in the 'The Warrnambool Standard' called 'Winning the bipolar battle'. BALANCING life and motherhood while managing her mental illness is a battle Gabrielle Bushell has been fighting and winning for more than 18 years. As a young mother diagnosed with bipolar disorder when she was 20, Ms Bushell has overcome her fair share of life's challenges and now she's written a book about her experiences. Ms Bushell said she hoped telling her story might help others by dispelling the myths surrounding the mental illness. "It's about my journey," she said. "It's a very personal book but I hope by doing this people can understand what people with bipolar and their families go through." The book, Bipolar - A Balancing Act, also contains contributions from family members and close friends who have been part of Ms Bushell's journey. The 224-page book also answers many of the questions Ms Bushell has been asked about her illness. A supportive crowd of family and friends gathered at the book's launch at the South West Institute of TAFE library last Thursday night. Taking inspiration from her son and support from her family, Ms Bushell has not had a severe bipolar episode for 15 years and hoped her story would inspire others. A limited number of Ms Bushell's book will be available from South West Institute of TAFE this month. Eve Lamb of 'The Warrnambool Standard' did a good write up of the Reunion called 'Family a long way from Tipperary'. That makes quite a few since 1881. The Mortlake Football community honoured the contributions that Peter (Myles) Delaney has made to football over the years. The Mercy Hospital, Melbourne, had an article to pay tribute to Joe Delaney's time there as president, but it's disappeared into cyberspace. The Warrnambool Standard Magazine section of July 10th 1999 had a cover story called "The Whiskey Trail" with a picture of Whiskey Tom and his grandson Tom Delaney the Nirranda farmer. 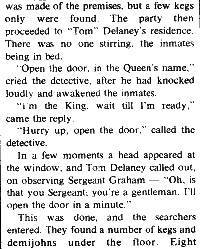 "Open the door, in the Queen's name", cried the detective after he had knocked loudly and awakened the inmates. "I'm the King, wait till I'm ready", came the reply. "It is hard to tell which is the best kept and cultivated farm along the Nirranda road. Mr. P. Delaney, Mr Murphy and Mr. Steele have each a paddock of potatoes, and there isn't one weed to be seen in either of the crops." The "Mr Murphy" mentioned could be Robert Murphy, the husband of Mary (Murphy) Delaney, a sister of Tom & Pat. "It is a great pity that after all this labour bestowed the prices, as a rule, should not compensate them for their trouble." It didn't take long for the Delaneys to get in the newspapers, albeit indirectly. After the first still seizure and John Delaney & Denis Dynans's arrest on Monday, March 7 1881, Job Wines bought the confiscated whiskey and put this ad in the Standard on April 23rd 1881, inviting all to a "sampling" at his hotel in Woodford of the "Celebrated Nirranda Whiskey" .